Here’s Kip and Dale (Kip Cullers and Dale Ludwig – l-r). I have to post this since Haley Wansing sent a picture and I’ve received about a half a dozen news releases on it. You see, Kip has a world soybean production record. He farms in Purdy, MO. If you read this segment from MSA’s news release you can figure out where the other news releases came from. Cullers utilized BASF Headline fungicide and Syngenta Warrior insecticide on his soybeans during the growing season as instructed on the product labels. 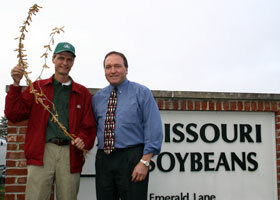 The record-setting yield was harvested Oct. 7, 2006. Cullers’ weigh check was witnessed and verified by a third-party, MSA-approved official. The award-winning crop was grown in a sandy loam soil in Newton County near Stark City, Mo. The seed populations used on the field were close to 300,000 with about 245,000 plants in the final stand. The soybean plants averaged approximately 120 pods per plant.